In 2017, Nintendo introduced its latest and greatest gaming system, the Switch. What has fans and gamers excited worldwide is the Switch’s unique versatility. Like most other consoles, when at home, you can play the Switch in full, beautiful high definition on your own television. But where Nintendo has the rest of the competition beat is in portability: when it’s time to head out, you can bring the Switch with you and keep playing the Legend of Zelda, Mario, or Splatoon 2 on the go! The challenge, as is the case with pretty much every portable device, is battery life. According to both Nintendo and independent testing, you can expect about two to three hours of gaming on a full charge, depending on performance settings. That’s barely enough time to save the Princess. Thankfully, we at RAVPower have an easy solution – a portable power bank! Original photo by TheOneInYellow. Follow his Instagram and Twitter. Not all portable chargers are suitable for every task. You need the right key for the right lock. For charging your mobile Switch, you should keep a couple features in mind when buying a power bank. First, be sure it works with USB-C, the main input on the Switch. USB-A to USB-C works as well, but charging will be considerably slower. While it’s absolutely worthwhile picking up a power bank that includes Quick Charge technology, especially if you plan on using it for other devices, it’s important to highlight that the Switch currently does not support any quick charging standards. Second, you need to use a power bank that has more internal charge than the Switch’s 4310mAh battery, considerably more if you hope to power up the console more than once. You should aim for a unit that’s 10000mAh or higher, giving yourself plenty of gaming time. Third, be sure that the power bank charges at roughly 5V, the same input requirements as the Switch. Otherwise, you risk damaging your device. How Much Game Time Do I Get with a Power Bank? Short answer: a lot! A number of independent test sites have tried out power banks with the Nintendo Switch and the results are really exciting. With a RAVPower 26800mAh power bank, users have reported being able to recharge their Switch at least three times! Some reviews have that recharge potential at upwards of six times, depending on screen brightness and graphics requirements. That brings your gaming time from a mere three hours to ten-twelve hours without breaking a sweat. Over a five day period, the same tests averaged between nine and eleven hours of gameplay while keeping the Switch plugged in and charging from a portable charger. That’s about a 10% battery charge per hour of gaming. Get Your Switch Ready Power Bank Today! Like most gamers, we at RAVPower were really excited for the launch of the Switch. We braved the lines, picked up our consoles, rushed home, and hurriedly unwrapped them. We love being able to bring our Switch with us wherever we go, playing with friends and strangers alike. And now, thanks to the availability of affordable power banks, like our 26800mAh and 20100mAh, we never have to worry about battery drain in the middle of a critical quest. We’ll be sword dueling, kart racing, and splatting ink for hours and hours to come. Get RAVPower’s 20100mAh USB-C Power Bank for 20% off until August 10th with code SPLATOON. Find it here. Where’s your favorite place to play your Switch? Tell us in the comments below! Hi Ervin, we currently don’t ship to Malaysia but you are welcome to order on amazon.com or amazon.co.jp and then ship to Malaysia with a logistic carrier. However, this could be a little expensive! I actually used my Switch, playing Splatoon 2, and a RAVPower 20100 mAh QC 3.0 battery pack a few weekends ago. I used a USB-A to USB-C cable. After about 5 – 6 hours of play, the battery pack still had about 1/3 – 1/4 charge (just went from 2 lights down to 1 when I unplugged the Switch.) Not using the USB-C cable, it didn’t charge fast enough to actually up the battery % much more than it was already at, but it did keep me playing with three other friends on a local Salmon Run spree while maintaining my current battery life that I started out with. Will be purchasing a USB-C cable to try that soon. Thanks RAVPower! Happy to hear there was enough power to sustain you and three friends! How is Splatoon 2? Your advice to make sure it only provides 5v of power is bad advice. The Switch actually accepts up to 15v. However, it does appear to be true that the switch will only pull over 5v if the bank or charger is USB c to USB C and supports USB-PD. 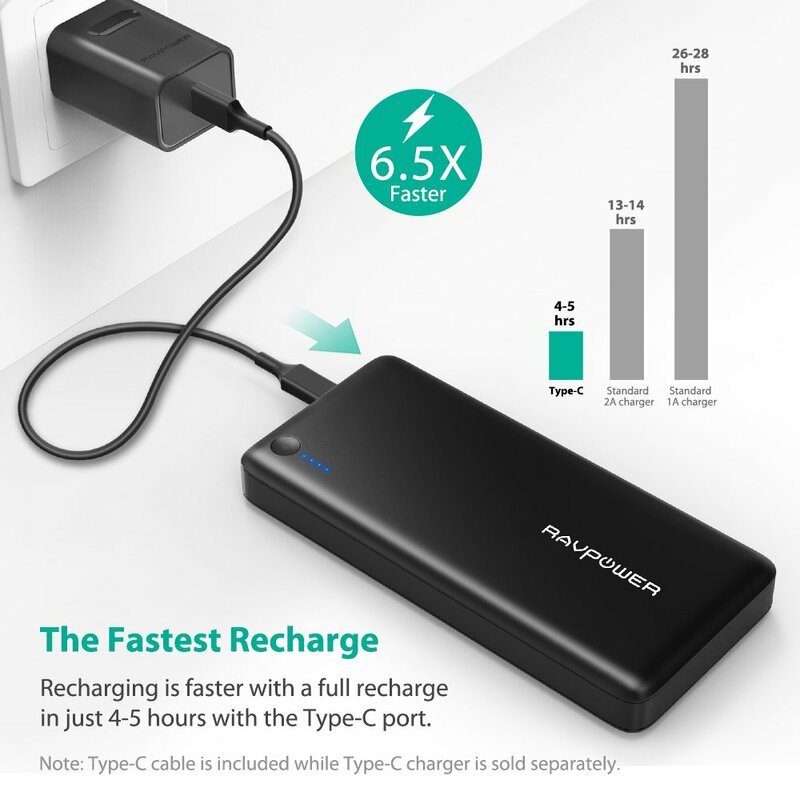 If you can get a power bank like that you’ll almost double your charging speed over just USB C to USB C and more than double over USB A to USB C.
Good point. Keep the above in mind everyone. Hi, I’m close to purchasing the RavPower 26800 (via Amazon.com) for my Nintendo Switch, but I have a few questions/concerns. Does the RavPower 26800 come with a USB C to USB C cable or any cables? I checked the answer/question page on Amazon.com and some people are saying yes, while others are saying. I’m not sure who to believe. Also, what’s the best way to charge the RavPower 26800 when plugged into the wall? USB C or Micro USB? A USB-C cable is included with this product. It’s best to charge with a USB-C/Type-C charger in order to benefit from the super fast recharge speeds. I’m interested in the ravpower 26800 power bank for my Switch. I’ve read on Amazon that the Switch won’t charge while outputting to hdmi. Does that mean that while I play docked, the Switch will stay at whatever percentage it is in? Or that the Switch will go down in percentage as if it wasn’t plugged into anything? Great question. As someone who has only played the Switch for 2 minutes (I know, so sad but hey, I still go to enjoy BotW on the Wii U), I cannot actually tell you. Does anyone know the answer? I have a portable charger that has an output of 5 volts (direct current) but it only has 6,700 mAh. It’s a Lithium Ion battery pack and I was wondering if I got a USB A to USB C cable, would it be safe to charge? And would it even work? Complex answer incoming. So, yes, you can use a USB A to C charging cable to connect the 6700mAh power bank (5V/2.4A) and your type-C device. However, we are not 100% sure if it will work or not. For example, it will work when using the 6700 to charge a Samsung S8 (S8 supports a 5V/1A minimum to 9V/1.67A maximum input voltage and current. The max charging speed that the S8 can get is 5V/1.67A. (Please note that sometimes it can be even less, such as 5V/1.65A since the charging cable will consume a little bit of power). So if your type-C devices’s main input voltage is higher than 5V, then the power bank is not powerful enough to power up your device. Hope that’s clear. Message us if you need more help. Do RavPower do anything that can power a Docked Switch? IE: Do you have a power bank available that can power the Switch Dock without Mains Power? Hey, I am thinking of buying one of your batteries but it’s not the two you list specifically for the switch. It is the “22000mAh External Battery 22000 Power Bank 5.8A Output 3-Port Backup Battery Packs (2.4A Input, iSmart 2.0 USB Ports, Li-polymer)” (copy pasted from Amazon)… should that work? It will work but it will charge very slowly. What you need is something that has a Power Delivery function. Click here to learn more about Power Delivery. Can i use Nitendo Switch power adapter to charge Power Bank?? Its worth speed of charging? That depends on the power bank. If the power bank has a 2A input and the Switch adapter is 2A, then you will get a fast charge. Can i charge my Ravpower XTREME 26800mAh PD with my Nintendo Switch wall charger? is it a good idea? The answer is yes but it will be slow.